The territory of Central Kazakhstan covers 398.8 sq. km., with a population of 1.72 million people, and a population density of 4.5 people per sq. km., 86% of whom live in towns and settlements. It is a treasury of natural resources. Lake Balkhash, one of the largest lakes in the world, is situated in Central Kazakhstan (Karaganda province), as well as a unique Kargalinsky forest-mountain oasis. Mountaineers will be thrilled by the picturesque Ulutau Mountains. This region has many memorable places, in which have been preserved many archeological and ethnographic sites. Wide and vast spread the slopes of the Saryarka: from the picturesque granite massifs of Karkaraly, Kent, and the Kyzylrai mountains in the east to Tengiz Lake and the Ulutau mountains in the west, from the Ishim River in the north to the Betpak-Dala desert in the south spreads a large steppe, which was long ago named by the kazakh people as Sary Arka, which means "yellow range". Nature has generously endowed this land. Its lands are rich in natural resources. Here in the very heart of the Eurasian continent summer and winter pastures abound and the mountains and hills glitter with bright light. This area is not as desolate and dry as many are accustomed to thinking. This area has, aside from Tengiz Lake, more than 200 other lakes - habitat for swans, geese, ducks, cranes and herons. The name Karkaraly roots from the name of traditional Kazakh women's hats - karkary, artfully covered with beads, lace, * silk, velvet and owl feathers. And like this bright Karkara, the Karkaralinsky Mountains shine with all the colors of the rainbow. Its elevation is comparatively low: the highest point is the three-pinnacled peak of Komsomol (1403 m above sea level), which rises 400-500 m over the surrounding hills. The total territory of the oasis is about 1000 sq. km. 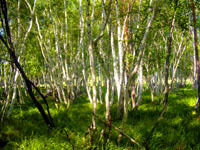 The mountains are covered with pine and birch forests, and various kinds of grasses. The names bestowed upon the cliffs, mountains, valleys, lakes, and rivers eloquently speak of these lands: Eagle Summit, Dear Mountain, Red Bird Hill, Red Mountain Clif and lakes: Mirror Deep, Plough, Shaitankol (Hell Lake). Karasor Lake (Tyzdigul), has an area of 250 sq. km. and various kinds of grasses. The names bestowed upon the cliffs, mountains, valleys, lakes, and rivers eloquently speak of these lands. There is a legend, saying that a rich man, Balkhash, had a beautiful daughter, Ili. Once Balkhash held a feast and promised to give the winner of the contest his daughter as a wife. Ili loved Karatal the shepherd. She helped Karatal win the contest between the grooms. But Balkhash didn't want to give him to Ili, so the young lovers ran away. The angry father could not catch the fugitives so he turned them into rivers and turned himself into a lake between them. Balkhash Lake is the largest mouthless body of water after the Caspian and Aral seas. seas. Its length is 614 km., width is 3.5 to 44 km, and maximum depth is 26 m. The greatest phenomenon of Balkhash Lake is the varying mineralisation of its western and eastern parts, connected by a narrow gulf. The western part gets water from the Ili River and is fresh; the eastern part is salty. The nature of Balkhash is wonderful land of contrasts. Bektuata Mountain Range is an oasis in the North Pribalkhash area. The pink peak of Bektuata soars to a height of more than 1000 m. In clear weather it can be seen over 100 km. afar, so it has gained the moniker "light house of Pribalkhashye". Bektuata is not vast (4000 hectares), but includes a great variety of wonderful rocks and gorges. In the depths of its caves one can find mountain crystal morion, a rare type of quartz. This area also features numerous ancient monuments and burial mounds, many of which have been preserved and may be still hiding mysteries of the past. In Saryarka, 88 archeological sites situated in different regions have been put under official protection. There are the Aktasti and Klish mounds, Dermen settlement, Aidagarly cave, the group of mounds at Karasay, etc. The most interesting specimen of cultural architecture from the 18th c. is Ak-Beket Mazar. A "Mazar" is a circular building in the shape of a yurt (tent). Thus, Central Kazakhstan is a land where different ages merge. The latest archeological excavations testify that the steppes of Saryarka were included in the trade and cultural sphere of the Great Silk Road. In a nutshell, a meeting with Saryarka promises * every visitor something fascinating.